John Stones wants to leave Everton. Chelsea have been tapping on the player’s door all summer, keen to spend all that filthy lucre on the great English hope. Everton are not a big brand. They cannot offer Stones Champions’ League football and massive wages. Roman Abramovich’s Chelsea can. But Everton can offer Stones a home where he can make mistakes and learn his trade. They can offer him loyal fans who do not turn up only to see their side win, and a young talented manager who wants to keep him. 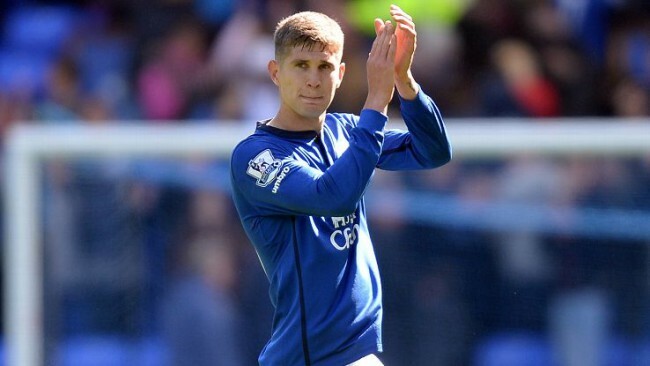 Stones should stay at Goodison Park, writes Tony Barrett. The theory throughout an increasingly tortuous transfer saga has been that there would be an offer that would make Everton buckle, but by adopting such a strong position through their manager, the club have given themselves the best possibly chance of keeping Stones. Should they do so, they will send a message to clubs in a similar position that they do not have to yield to the league’s biggest fish; that even when a player has formally expressed his desire to go, they can ensure that he sticks to the contract he signed and prevent a scenario in which a club as powerful as Chelsea make themselves even stronger at your expense. Chelsea, of course, are only doing to Everton what they did to Barnsley, from whom they bought the player for £2m. But Everton, one of the most decorated clubs in English football, are entitled to want more. Chelsea and Stones have every right to want the best for themselves – that is a desire that goes to the very heart of what sport is about; but that desire should not be exclusive to clubs who have the greatest wealth and the greatest current opportunities to be successful. For clubs like Everton to stand any chance of closing the gap they have to do everything they possibly can to keep their best players, otherwise they just end up in a situation in which they are constantly strengthening their rivals and weakening themselves. “We have great ambition, desire and great plans for John. We want to be a winning team and we need to keep our best performers and clearly John is big part of our future. “We are a big football club with an incredible tradition and we will carry on giving him everything we can. “There is a bigger example for the football authorities. Up and down the country every dressing room has similar situations. Are we going to end up with players feeling bad about themselves, not to be proud of representing their colours? “It becomes an unsustainable position. It needs to be changed. The players are human and human beings deserve the time to think about the next step of their careers – but that cannot be done when there is an official game. “I feel let down by the football authorities in this position. We should look after our players and we will make sure we will look after John. “Going away from John’s situation we have to understand when the window is open and there are official games we need to give some value to contracts. Chelsea will have to match Everton boss Roberto Martinez’s £45m asking price if they are to secure a deal for defender John Stones. “If he really wants to go, mentally it is very difficult to have a player playing to his maximum when he is somewhere else. “From a financial point of view, it is crazy not to sell him. “What can happen this season is, God forbid, he could do a cruciate knee ligament or he could have a bad season if his head is not right – and the huge attention on him now from the media could have an adverse effect. “Who do we replace him with? There’s no one as good as him, at his age, who’s going to be an England regular and who’s going to get better and better. Common sense says we don’t sell him. “Money can’t buy what this club needs. This club needs to show ambition and that it’s not a selling club. If they keep selling players it shows that we’re happy to be constantly mid-table with no aspirations for anything more. “It could be a different story if there was better communication between the board and the fans, but there’s none. No one knows if there’s money in the club or not. We don’t know if we can shop in Aldi or in Harrods. “Even with the money, who can replace Stones? Johnny Evans is being talked about, but he’s not as good as John Stones. Why would you settle for second best? At the beginning of this saga, Martinez was critical of Chelsea… but Jose Mourinho and his executives have done no wrong. This is just how they and others operate in today’s football world. Unlike Everton on occasions, they won’t look inside their own ranks and academies to solve problems. It is the way City, Manchester United and Chelsea work. Mourinho is fully aware that he would be investing in a long-term asset capable of playing for Chelsea for the next decade. That fact, combined with the precedent set so pertinently by the Londoners’ sale of David Luiz for £50m last year and the investment Manchester United made in Rio Ferdinand 13 years ago – adjusted for inflation, that would be £43m today – shows that even £30m would represent a steal for a player of Stones’ potential. It is vital, therefore, that Martinez and Bill Kenwright must resist all attempts from Chelsea to prise from their grasp a gem that embodies both the manager’s youth-based rebuilding programme and the standards set by defensive greats from Everton’s past like Brian Labone and Kevin Ratcliffe. Oh, how sweet it would be for Everton to deny Chelsea.